This is a post Mother's Day entry. I have been meaning to post about it eons ago but I got buried deep in my tasks so I didn't get the chance at all. It was only today that I remembered that I haven't anything about how my Mother's Day went. How things turned around was quite unexpected. It was a fine Sunday. We went to church to hear mass and then greeted our mother friends a Happy Mother's Day after the service. I knew that Hubby wanted to stroll around and relax first but I was grumpy and exhausted so we went back home. Not in the mood to do anything at all, I went back to sleep. Hubby and the little one slept with me too. I don't know how long I slept but I can remember that I heard Hubby telling me that he was going out for a while. I slept on. 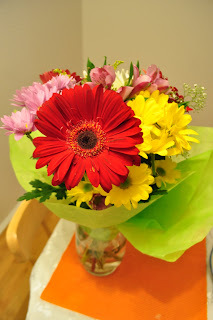 Then much to my surprise, he woke me up, a bunch of fresh flowers in his hands. It was his Mother's Day surprise for me. And more surprises came when I went out of our room. Nope! There were no rose petals on the floor, no candles lit, no dim lights nor soft music playing. There was nothing at floor! I mean, the living room was clean. All the mess that were there in the morning were all gone! And there was dinner waiting on the table. It was all such a surprise! And this very sweet gesture from my Hubby was very unexpected. Thanks Dad for making my day. You always know how to make me smile at the most unexpected times. Awww... ang ganda-ganda ng flowers! Really so beautiful! Everything he did was really sweet!